Kobach maintained that he still believed the recusal to be unnecessary. Kansas Secretary of State Kris Kobach, leading by just 121 votes in the state's Republican gubernatorial primary, said in an interview on CNN Thursday evening that he is "happy" to recuse himself from a recount in the razor-tight race. "We'll be formally answering his request tomorrow but I'll give you a heads up yes I'll be happy to recuse myself," Kobach told CNN's Chris Cuomo, before adding "But as I say it really doesn't make any difference, my office doesn't count the votes, the counties do,"
Kobach's lead in the race shrunk by more than half on Thursday when election officials discovered a clerical error made by his office when counting returns from Thomas County, which lies in the northeast corner of the state. Thomas County Clerk Shelly Harms told ABC News on Thursday that the Kansas Secretary of State's office confirmed to her that the error was made by their office and not at the county level, and that the official tally she submitted counted 522 votes for incumbent Gov. Jeff Colyer and 466 for Kobach. According to the Associated Press, there were also votes in Haskell County that were not counted on election night. With those votes included, the margin between Colyer and Kobach stoof at 121 as of Thursday evening. Colyer asent a letter Thursday to Kobach requesting that he stop advising local election officials before the results in the race have been officially certified. "It has come to my attention that your office is giving advice to county election officials – as recently as a conference call yesterday -- and you are making public statements on national television which are inconsistent with Kansas law and may serve to suppress the vote in the ongoing Kansas primary election process," Colyer wrote the letter. The incumbent requested a response from Kobach by 9 a.m. on Friday morning. A recount in the race is likely, but cannot be officially requested by Colyer until next week when all the provisional ballots in the state are counted. There is no law in Kansas requiring Kobach to recuse himself from a recount. On Wednesday, Kobach said he was not recusing himself because "the recount thing is done at a county level," adding that the secretary of state does not directly participate in the recount process. "The secretary of state’s office merely serves as a coordinating entity overseeing it all but not actually counting the votes," Kobach said Wednesday at a campaign event. "This is of course an issue that arises in any state that has an elected secretary of state," Kobach added. 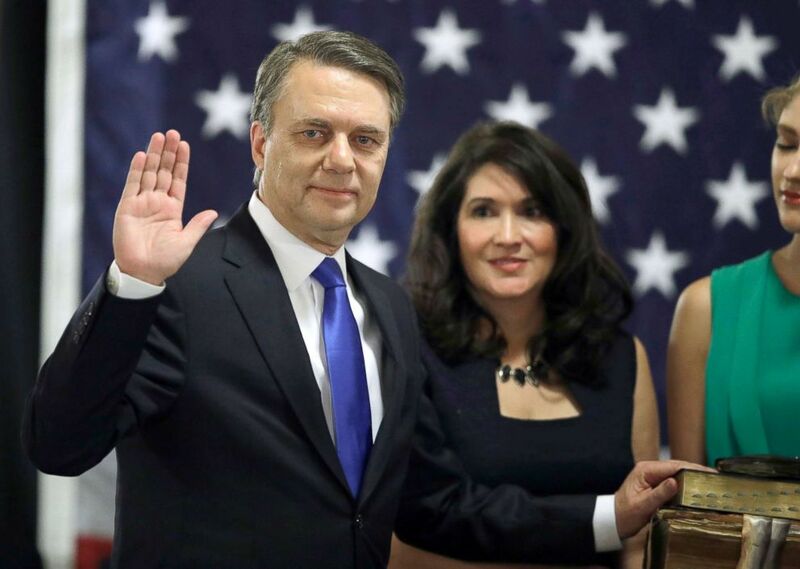 (Orlin Wagner/AP, FILE) Jeff Colyer is sworn in as the 47th governor of Kansas during a ceremony at the Statehouse in Topeka, Kan., Jan. 31, 2018. Colyer, who ascended to the Kansas governorship in January following the resignation of Gov. Sam Brownback to become the U.S. Ambassador-at-Large for International Religious Freedom, has not conceded the race and the Associated Press did not make a projection after Tuesday's initial results. "Given the historically close margin of the current tabulation, the presence of thousands of as yet uncounted provisional ballots and the extraordinary problems with the count...this election remains too close to call," Colyer said in a statement released Wednesday. "We are committed to ensuring that every legal vote is counted accurately throughout the canvassing process," Colyer added. Looming over the result is the more than one percent of the vote garnered by two teenagers who also ran for the GOP nomination in the governors race, Tyler Ruzich and Joseph Tutera. Unofficial returns showed that Ruzich and Tutera earned 3,758 votes in the race, more than accounting for the 91-vote gap that now stands between Kobach and Colyer. According to the Kansas City Star, Colyer has the right to request a recount if he still trails after provisional ballots in the state have been counted. "Next week we'll know what the provisional total is and we'll add them together and we'll see what the final number is," Kobach said in an interview with Fox News on Wednesday. The Kansas Secretary of State's office did not immediately respond to ABC News' request for comment when asked how many provisional ballots remain outstanding in the state. Kobach is the former vice-chair of President Trump's now-defunct commission on election integrity, and remains a close Trump ally. Trump tweeted support for Kobach ahead of Tuesday's primary, calling him a "strong and early supporter." Kobach has generated controversy during his tenure as Kansas' Secretary of State over what his critics call attempts at "voter suppression. The American Civil Liberties Union (ACLU) has filed four different voter suppression cases against Kobach, and in June a federal judge struck down Kansas’ severely restrictive voter registration regime, ruling that Kobach’s documentary proof-of-citizenship law violates the Constitution and the National Voter Registration Act. The court ordered Kobach to attend several hours of legal training, as a sanction for his "repeated and flagrant violations of discovery and disclosure rules." Kobach has also faced fines for voter suppression. Whoever prevails on the Republican side in the governor's race will go on to face Kansas state Senator Laura Kelly in the general election. Kelly easily won the Democratic nomination in the gubernatorial race Tuesday, garnering just over 50 percent of the vote in a field that included former Wichita Mayor Carl Brewer. 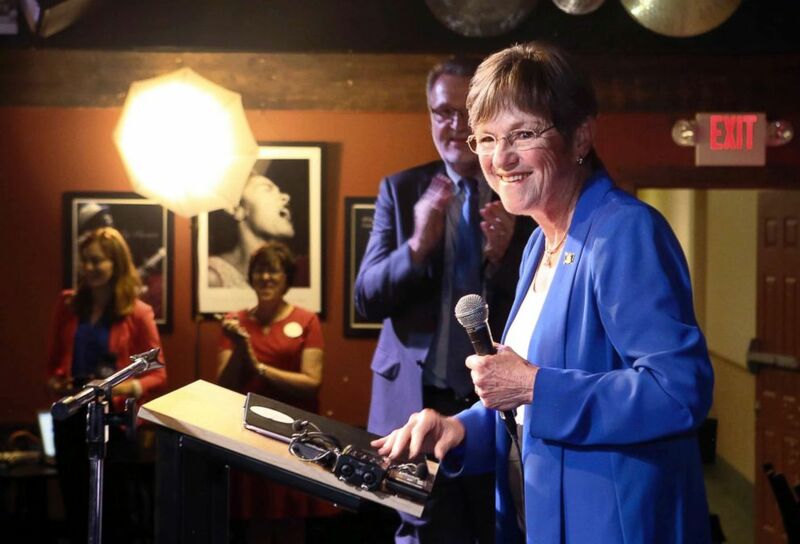 (Thad Allton/The Topeka Capital-Journal via AP) State Sen. Laura Kelly, with her running mate Lynn Rogers behind her, speaks after it was announced that she was the winner in the Democratic race for governor at the Ramada Hotel and Convention Center in Topeka, Kansas,Aug. 7, 2018. In a statement released after her victory Tuesday, Democratic Governors Association Chair Gov. Jay Inslee, D-Wa., praised Kelly as a "serious leader," and criticized the Brownback administration, which cut taxes sharply but did not see the subsequent boost in economic growth that was promised. "Sen. Kelly has seen firsthand how much damage Sam Brownback did to the state of Kansas, and she will make sure they never make the same reckless mistakes in the future," Inslee said, "She will finally fund Kansas schools, rebuild the state’s infrastructure and get the state’s economy back on track after the Brownback years." According to William Gale, a senior fellow in the Economic Studies Program at the Brookings Institution, Kansas' economy "did not grow faster than neighboring state, the country itself, or even Kansas' own growth in previous year. The Republican Governors Association told ABC News that they are not commenting on the contest until there is a certified nominee in the race. ABC News' Lee Harris contributed to this story.